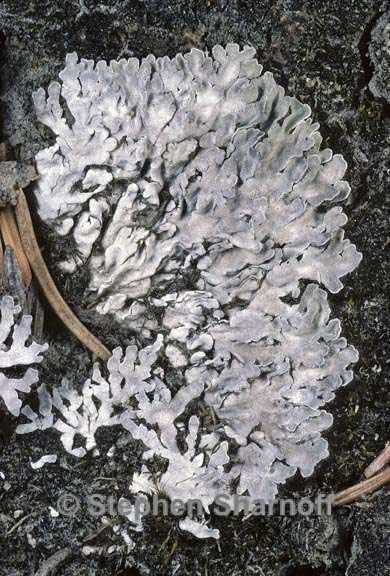 Thallus: foliose, up to 12 cm in diam., usually irregular and often coalescent and entangled with other thalli, only occasionally orbicular lobes: generally linear, discrete to entangled, 1-3 mm broad, usually ascending and noticeably concave, especially near the ends upper surface: gray-brown to dark brown, partly to almost completely pruinose; without soredia or isidia, but sometimes developing smaller lobes or lobules centrally, which may be ascending like the peripheral lobes, sometimes becoming dense and turf-like, without soredia or isidia upper cortex: paraplectenchymatous medulla: usually white, occasionally pale yellow lower cortex: irregularly prosoplectenchymatous lower surface: pale or darker brown on the peripheral lobes, darkening to black inwardly, dull to weakly shiny; rhizines: black, mostly squarrosely branched Apothecia: common but not rarely missing, up to 5 mm in diam., the margin entire or often developing lobules ascospores: 24-33 x 12-17 µm Spot tests: usually all negative, the medulla occasionally K+ yellowish, KC+ yellow-orange (when the medulla is pigmented yellowish) [very rarely the upper cortex reacts K+ very faint and KC+ stronger yellowish, apparently due to the presence of variolaric acid] Secondary metabolites: often absent, but sometimes producing secalonic acid A (accessory pigment) and/or variolaric acid (accessory). Substrate and ecology: on mosses, Selaginella, or detritus, usually over soil or rock World distribution: North America, Europe, Africa, Asia, South America Sonoran distribution: southern California, Arizona and Guadalupe Island (Baja California). Notes: The lack of soredia and isidia, the distinctive growth form with ascending, concave lobes, and the distinctive substrate usually make this a fairly easy to determine species. Moberg (1977) mentioned that extreme forms of this species and P. distorta (as P. pulverulenta) can be difficult to distinguish, and this is even more true for P. muscigena and P. americana, since there is no difference in anatomy of the upper cortex to help separate them. Only a few such problematic specimens have been seen, mostly poorly developed material or damaged specimens. The two specimens from the coastal islands (San Clemente Island, California, and Guadalupe Island, Baja California) are a diminutive form, and bear some resemblance to P. petraea (Poelt) Vězda & Poelt, a P. musicgena relative so far known only from Europe. These two specimens are rather sparse, however, and one of them is heavily parasitized, and so more adequate material will be needed in order to evaluate the identity of this material.